The Emergency Center is proud to offer transparent pricing and affordable self-pay rates, so our patients never receive a surprise bill. We Value Our Patient’s Trust. Don’t hesitate to seek emergency care if you are unsure. Come in and let our Board Certified ER Doctors diagnose whether you’re having an emergency, and if you aren’t, we will facilitate your referral to an urgent care that’s right for you. As they say, it’s better to be safe than sorry. If necessary, our dedicated patient advocate will work with you and your insurance to ensure you’re not stuck paying for emergency treatment that should be covered by your insurance plan. Why choose The Emergency Center’s Fort Worth ER? The Emergency Center also accepts all commercial insurance plans. What is the difference between a freestanding emergency center and a hospital ER? Freestanding emergency centers function just like traditional ERs with the exception that they are not connected with a hospital. Because we experience a smaller patient volume than a typical ER or urgent care clinic, we are able to provide immediate acute care services. Additionally, in the event that a patient requires surgery, we will stabilize them and quickly arrange their transportation by ambulance to a nearby hospital, allowing them to bypass the lengthy wait times typical of hospital ERs. What’s the difference between a 24 hour freestanding ER and an urgent care? The Emergency Center is more than an urgent care, in more ways than one. Don’t make the mistake of visiting an urgent care when you may need an emergency room. Our ER should be your first resort when your health is at risk. If you aren’t having a medical emergency, you will have the opportunity to sit down with a doctor to discuss your options before making any treatment decisions. The Emergency Center is well equipped to handle common children’s and pediatric conditions, and even more chronic conditions, such as abdominal pain and asthma. Come see us to avoid excessive wait times and risks of interhospital transfers at traditional ERs that are overwhelmed or ill-equipped to handle your child’s emergency. Learn more about our 24-hour emergency care for kids. The physicians and nurses at our Fort Worth ER act swiftly in diagnosing and treating a variety of emergency and non-emergency illnesses and injuries in both children and adults, allowing patients to get back to enjoying life as quickly as possible. Whether you are suffering from head, chest, or abdominal pain; fractured, sprained, or broken bones; shortness of breath; vomiting; dehydration; or even seemingly mild symptoms like a fever or sore throat, you can trust that our team of experienced medical professionals will treat you as if you are the most important person in our facility, and provide you with friendly, immediate care in a relaxed setting. In order to provide patients with the highest level of comprehensive, immediate care, The Emergency Center is fully equipped with a wide range of leading-edge technologies in one convenient location. For example, our high-resolution 64-slice CT scanner provides advanced imaging, such as detailed evaluation of coronary arteries. Our Fort Worth facility also has an onsite laboratory and pharmacy, eliminating the need for patients to travel elsewhere when these services are needed immediately. At The Emergency Center, we take a unique, patient-centric approach to emergency care. We make it our priority to educate each and every patient on their condition and treatment options, so they can make an informed decision about their health care. Additionally, because we understand that remembering medical information can be challenging when you aren’t feeling well, our patients always receive an audio recording of their diagnosis and at-home care instructions upon leaving our facility, and may also receive up to 72 hours of their prescription medication, allowing them to return straight home and rest. We also utilize advanced telemedicine services, which allow our physicians to follow up with patients “face-to-face” through a smartphone, tablet, or other device. It’s just another way we make receiving quick care more convenient for our patients. Learn more about The Emergency Center Experience, a difference you can feel. 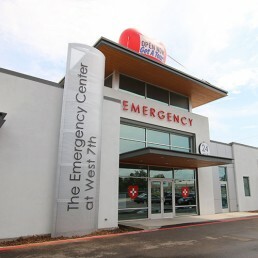 If you or a loved one in the Fort Worth area requires prompt, convenient, and comprehensive emergency care, trust our Board Certified Doctors, ER trained nurses and friendly staff at The Emergency Center.